This year I’ve been trying to use “exit slips” at least once a week in my classes. They’re to let me know whatever I want to know. Do my kids have any questions? Did they take away what I hoped they’d take away from class? Can they actually solve a problem we were supposed to have mastered a couple days ago? What they’ve really done for me is highlighted how little my kids learn — especially my tenth and eleventh graders — in class. And how much more time I need to build into my plans to have them practice problems and ask each other questions and, well, basically go through that time to struggle in front of me. Of course where that time will come from, I don’t know. But I need to find it. But I’m amazed and horrified that I have never done this before. It’s the most eye-opening thing to be able to know exactly what your kids can do. And even when I felt like I did a bang up job in a class, and I thought my kids were getting it from walking around and watching them work, how there were a good number that didn’t. A good number that I wouldn’t be aware of before the summative assessment. Anyway, I thought I’d share with you the exit slips I’ve used in my Algebra II and Calc classes. I repeat to my students that these aren’t a test in any way. They’re for ME to know what they’re understanding and what they’re not so I can better help them. And they’re for THEM to get a sense of how well they understand stuff we’ve done in class, so they know if they’re on top of the material or not. 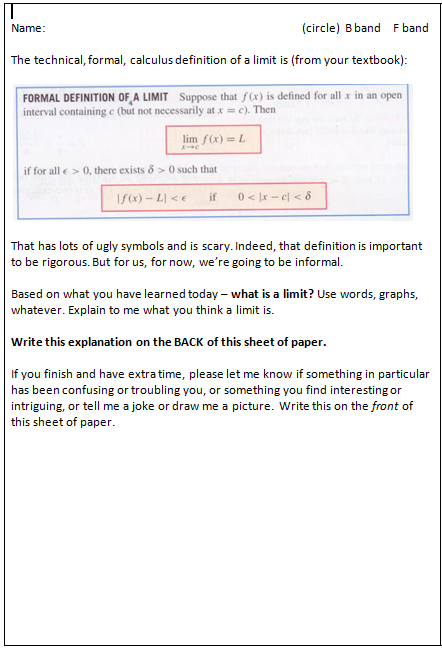 Plus I get to identify and address misconceptions, and also bad notation! If you use exit slips, or something similar in your class, please throw down any tips you might have for what works for you — what kinds of questions you put on there, what are the types of questions to avoid, what specifically and concretely do you do with the information once you’ve gathered it, etc.? Wow, this is great and just what I’m thinking about tonight. 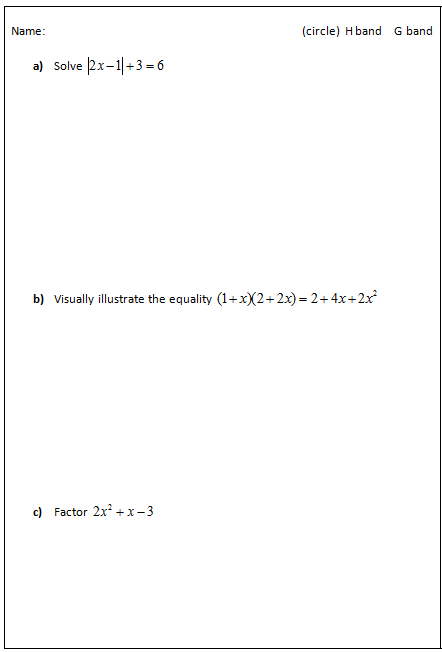 I really like the flipping the inequality one as working on misconceptions is the big thing I want to focus. I do skill quizzes which focus more on notation/mastery of basic concepts, but they can still be mimicking and get those right as they are just the math with no short answer. Thanks for the kick to get me going on these! About how much time do you give for them to answer these questions? How long are your bands? Bands are 50 minutes and we meet 4 times a week. I don’t do it every day — usually just once a week. I’m semi-regular about them. They get one 2 or 3 times a week depending on what we’re doing. Almost always I just use them as a mental plan for what I’m going to do the next day. I stand by the trash can and make two piles. Got it and don’t got it. I just quickly stack them and look at the size of the don’t got it pile. Then rifle through and see what’s going on and adjust my plans for the next day. Then they go in the trash. Very rarely do I do anything on the individual level for what I’d classify as an exit slip. I guess to put on my teacher hat I’d say, what is your intention for using them? How they look and what you do with them is dependent on your purpose. I’m looking for more of these kinds quick assessments, so thanks I’ll probably start using exit slips this week. Also, going to try clickers. But why is it that failing these methods it is so difficult for us to get an accurate understanding of student progress in class? I suspect that my students lean too much on each other and their textbook (and whiteboard) when in class, so when I think things are going dandy all I’m really seeing is what the kids can do with a lot of support. The trouble is that the kids themselves get fooled by this as well, and maybe do less homework because they think they already got it. I would say that it is way too easy to convince yourself that you understand something when you are in the presence of a supportive teacher and classmates. I think we have all experienced the sensation of listening and nodding your head saying ‘Yeah, I get it’ and then looking at the work – hours later, by yourself – and having NO idea what to do. I talk to my kids all the time about the questions they ask and the questions I reply with. If they can train themselves to ask those questions out loud – even when they are alone – they can often push through the confusion. I had a student two years ago who, due to very poor classroom layout, sat at the end of a deadend. So when I was walking around, I could only see him half as much as the other students. He was an absolute MASTER at LOOKING like he was working productively whenever I was nearby. After he completely bombed the first exam, I kept a closer eye on him from a distance and noticed that he was accomplishing nothing when I wasn’t nearby. I don’t know if he was fooling himself, but he was certainly making a deliberate attempt to fool me. * I call them “reality checks” instead of “exit slips” or “exit tickets.” Reality check just seems more descriptive for how I want everyone to think about them. * I have a large stack of template reality checks in the classroom. They have extras in their binders. 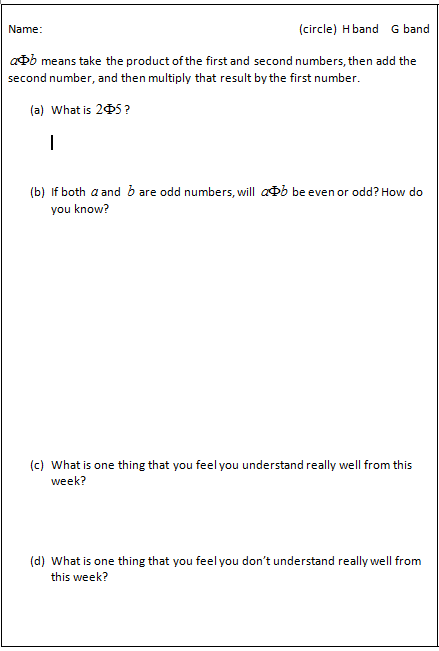 This gives me the freedom to make up a question, to change the question depending on how class is going, or to turn it into a homework quiz or something. * My questions tend to be shorter, and I usually give them about two minutes. * I try to gather feedback about the class at least once a week. I’ll ask them to rate the pace, rate how interesting the week was, to give me random feedback, to judge how prepared they felt for the quiz, to tell me whether they understand and like how they’re being graded, do you use the textbook, etc. The big role that exit slips play in my classroom is putting reality back at the center of things. I don’t pretend that they’ve learned material that they haven’t. They can’t pretend that they’re on-track if they’re lost. I can’t pretend that the class is interesting when folks are bored. Along with what a lot of other people said I use exit slips as a quick temperature check to figure out if the kids actually understood the message I was trying to get across. As a general rule of thumb, I like making my exit slips in a way that I can spend about 3-5 seconds per slip to analyze which students get it and which don’t. As an example, tomorrow I am going to be introducing functions and relations to my students. The exit slip i will use has a picture of a soda machine and has two questions. the first asks “is this a function or a relation? Why?” The second asks them to represent the soda machine using some sort of notation. We’ll see how it turns out. Thanks for blogging about this. Like you, I only just realized the value of these quick-checks that everyone had been talking about. I started collecting “warm-ups” and using exit slips a couple times each week. I’ve found that I can quickly make comments on them and get them back the next day. After reading articles stating that taking a test is the best way to prepare for “the test,” I’ve made these are a “no risk to your grade” opportunity for students to show me what they know, don’t know or to quickly find common misconceptions. MBP (@mpershan), I like the name you’ve given them! I think that I’ll start calling them “reality checks,” too. Do you guys correct and give the exits slips back to the students? Or just go over the answers as a class the next day? How do you handle the mistakes you find? I mark them up and hand them to them (but no scores on them — just feedback). If there are common errors, I’ll talk about them in class briefly. Or if there are misconceptions, I might build a short activity around that misconception. Or if kids can’t solve basic things, I’ll plan the next class with lots of practice time built in. I have regularly used exit slips for a very long time. I might even go so far to say that they’re the keystone of my teaching. (But I’m not going to go so far to say that as I’m not positive I’m using ‘keystone’ properly). I give exit quizzes about every other day. They take no more than 5 minutes. I am clear with students that my goal is that I know and THEY know if they understood today’s lesson. It’s just about today and it has helped tremendously with holding them accountable for learning the day’s concepts. 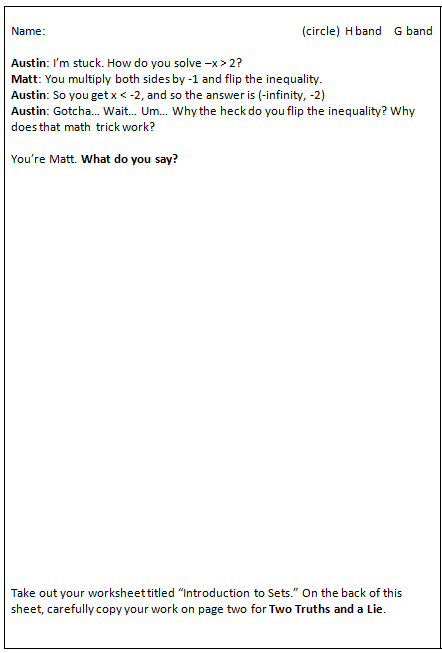 I grade them very quickly, usually 2 points per question (you have no idea, you kinda understand, you do understand). I list the skills from each quiz on a diva/divo poster that I make and if you get a perfect score, you’re a divo/diva for the day. The day following the quiz, I choose 1 which has a really good mistake, fold the corner with the name so no one can see it, and put in on the document reader. I write “Step 1” “Step 2” etc. by each line of their work and I ask the class in which step did the student first make a mistake. We discuss. I then pass back their quizzes and they have 5 minutes to correct them. Divos and divas go around and help. On days when a lot of people were lost, I pull a small group to the white board (the “huddle”) and we spent a bit longer going over misconceptions. In the meantime, divos and divas can work on homework or missing work. I’m always amazed that the divos and divas really, really change from day to day. My colleagues don’t believe me until they’ve tried it (they assume the same students get perfect scores and the same students always need extra help). The exit quizzes do count as quiz grades, but since they tend to be worth less than 10 points, no one quiz makes an impact on overall grades. But in total, they definitely add up over the semester. Absent students don’t have to make them up as it’s too complicated for me since I’m giving them so often. I just started using exit slips too. I just hand out a blank slip of paper and pose a simple problem that the kids should be able to breeze through after my wonderful lesson. No such luck. I make the two piles that someone else mentioned and the percentage of the totally befuddled is way higher generally than I expected. It is definitely a great reality check,if a bit discouraging. I use exit slips (I call them cards tho:)) I think I’d agree with MBP about the length of them. 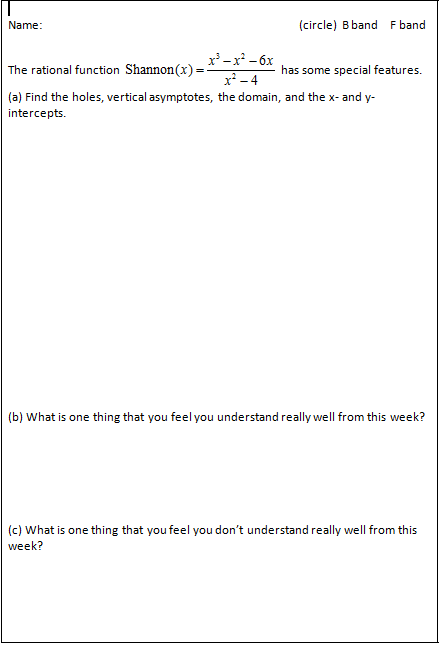 I tend to do shorter (one question) slips- it gives me enough feedback to decide who “gets it” and who does not. I do like that you pass them back to the kids. I do too- although if they get it I simply put a check on it- I have binders for the kids and they need to record how they did on the card in there (helps me too during parent conferences as I can pull it out to show parents even more data about what their kid is getting/ not getting) I do write comments on the ones that the kids didn’t get and then try (and I do mean try- I don’t always get to it) to talk with the kids who don’t get it about what they did wrong on the card. Anyhow I’d say keep it up because it can only help you! 1. Good work here. I wonder how appropriate the “what is one thing you really understood” question is. Students (and humans) are notoriously unreliable with self-reporting. 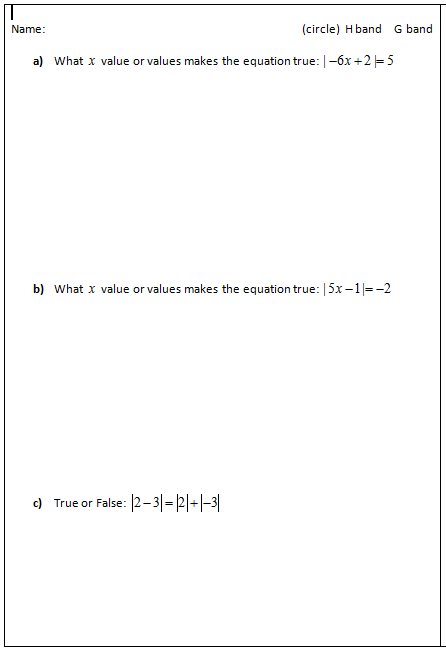 If your goal is to see what the actual answer to that question is, it may be better to stick to your well-crafted assessments (like Shannon(x)). 2. After a 50 minute period, how much should students be able to do? For the stuff you’re working on, they need considerable practice on their own, and outside of class. 3. How would you answer your limit question? 2. It’s a good question. Something like the rational function question, that’s on day 2 or day 3 of us working on it. So they’ve had practice. Some stuff I want them to be able to do at the end of class. It’s obviously dependent. 3. It doesn’t matter how I would answer it. I want to know what my students think – and a lot of them got some good main points. I also got some good misconceptions which we talked about in class. I teach 7th and 8th grade math and exit slips are like magical glimpses into the future. In what I call the “social grades,” exit slips allow a student to say what they are having trouble with without having to say it in front ofthe class and lose face.